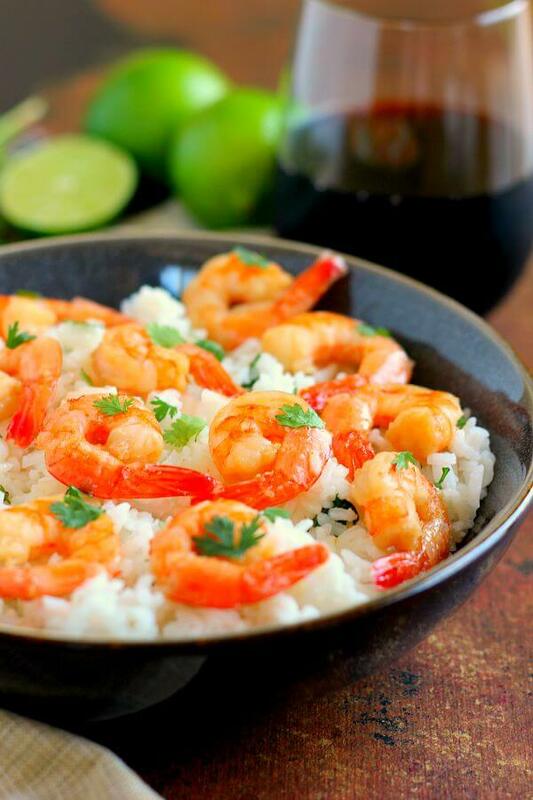 This Honey Garlic Shrimp and Cilantro Lime Rice Bowl is packed with tender shrimp, seasoned with a sweet honey garlic sauce and nestled on top of zesty cilantro lime rice. It’s ready in less than 30 minutes and bursting with flavor! Labor Day weekend is almost upon us, which signals the unofficial end of summer. I know I’m about the eleven-millionth person to mention this, but I feel like I just have to get it out there. But I’m trying not to dwell on the time. One of the good things about living in the midwest is that we get to experience every season in full. And fall just happens to be my favorite. So I’m trying to see summer ending and fall beginning as a positive change and not think about the fact that the colder temperatures are on its way. Nope, I’m not going to think about that. Instead, let’s talk about this Honey Garlic Shrimp and Cilantro Lime Rice Bowl. Quite a mouthful (pun intended), isn’t it? This is the first dish in a series of 30 minute meals that I’m going to share with you once a month, along with some of my other blogging friends. And I know that a lot of you love 30 minute meals, so this is a win-win situation! So, let’s get back to this Honey Garlic Shrimp and Cilantro Lime Rice Bowl. It showcases my love for shrimp (and garlic) and my adoration for anything with cilantro. It’s also make the most delicious 30 minute meal (sshhh it’s actually ready in 25 minutes!) that’s perfect for busy weeknights. This Honey Garlic Shrimp and Cilantro Lime Rice Bowl is packed with tender shrimp, seasoned with a sweet honey garlic sauce and nestled on top of zesty cilantro lime rice. It’s ready in less than 30 minutes and bursting with flavor! And because there is minimal prep work involved, that means you can whip up this meal in no time. And that means less time in the kitchen, which is always a winner in my book! Let’s first talk about the honey garlic sauce. Man, oh man, is it good! I love honey and I love garlic (as you probably know by now), so it was a no-brainer to throw these two together. To make this sauce, simply combine some olive oil, honey, lemon juice, soy sauce, and garlic powder. Toss the shrimp in there and then sautee in a skillet until the shrimp is opaque. Easy peasy, right? Now for the cilantro lime rice! Prepare the rice like normal, adding it to boiling water and then letting it stand for five minutes to thicken. Once it’s ready, toss in some cilantro, salt, garlic powder, and lime juice. Voila! This rice is ready to be paired with the honey garlic shrimp. This Honey Garlic Shrimp and Cilantro Lime Rice Bowl makes the most flavorful, delicious meal that is ready in no time! The flavors blend together to create a sweet and zesty combo that sure to be a meal-time winner in your house! 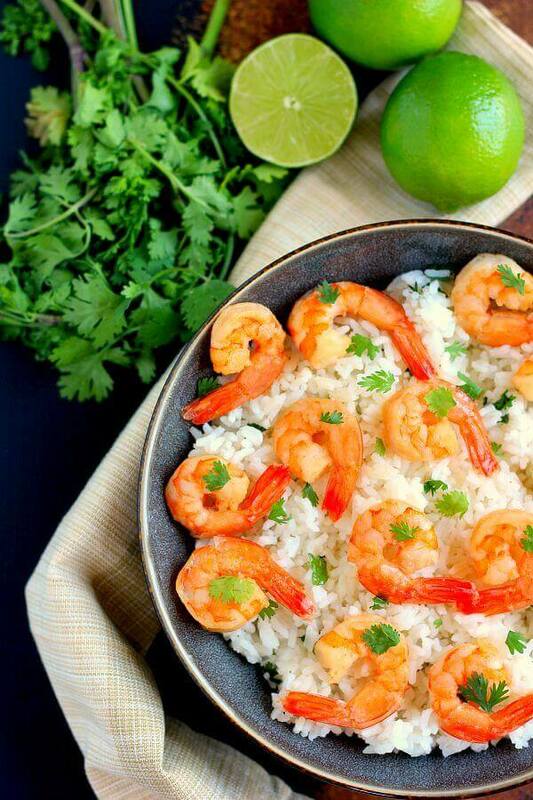 This Honey Garlic Shrimp and Cilantro Lime Rice Bowl is packed with tender shrimp, seasoned with a sweet honey garlic sauce and nestled on top of zesty cilantro lime rice. It's ready in less than 30 minutes and bursting with flavor! To prepare the rice, bring water to a boil in a medium pot. Add the rice, cover, and let stand for 5 minutes, or until water is absorbed. Remove cover and fluff rice with a fork. Add cilantro, salt, garlic powder, and lime juice. Lightly stir to combine. Set aside. To make the shrimp, combine the olive oil, honey, lemon juice, soy saice, and garlic in a large bowl. Add shrimp and lightly toss to coat. Pour shrimp mixture into a large skillet. Sear shrimp until browned and opaque, about 3-4 minutes on each side. Remove from skillet. Top cilantro lime rice with shrimp and drizzle with extra sauce, if desired. 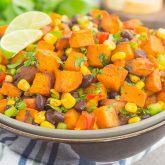 Looking for more 30 minute meals? Then check out these recipes from some of my favorite food bloggers! Honey and garlic shrimp sounds perfect Gayle. I just love shrimp, as it is so easy to cook and makes the perfect meal under 30 minutes, like this one. Thanks, Dannii! I love shrimp too...the flavor combinations are endless! Cilantro lime rice is huge in my house. I think my husband wants it every day. And this looks like a great bowl! Gayle, fall is my favorite season too!! and oh, I love this! 30 minute Thursday! what a great idea!!! love your honey garlic shrimp cilantro lime bowl and will definitely be checking out the others too! Thanks, Medha! Cilantro lime rice is my favorite! The combination of the honey and garlic on the shrimp sounds fantastic! I love that you took the extra step to make the cilantro lime rice. Just a few minutes adds that much more flavor! Thanks for the kind words, Kristine! Yes, a little extra flavor makes this bowl SO good! Love 30 minute meals and how quick and easy shrimp are to cook! Looks delicious! Thanks, Christin! This shrimp makes the perfect 30 minute meal! This honey garlic shrimp looks incredible, Gayle! 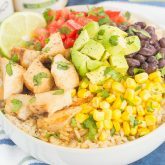 I love the zesty flavors and it sounds awesome with the cilantro lime rice! So bright, easy and perfect for weeknights! Thanks, Kelly! This is a favorite 30 minute meal of mine! My fiance would love this dish because shrimp is one of his favorite foods. I want to eat shellfish, too, but I'm not sure if I can. I tried shrimp with cocktail sauce once when I was a teenager and was fine, but I had shrimp fried rice another time and my chest started feeling weird. Maybe the shrimp fried rice had large amounts of MSG or something. Anyway, I like the idea of 30 minute meals because I know what it feels like to be in the kitchen all day. Sounds like this would be a perfect meal for your fiance, Neeli! 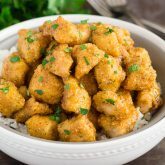 That's too bad that you're allergic to shrimp, but chicken would also make a great substitute in this dish! I LOVEEE this honey garlic shrimp! It looks amazing! Perfect weeknight dinner Gayle! And your photos are gorgeous!! Pinned! Thanks so much for the shrimp love and pin, Mariah! Yay! I love this series! 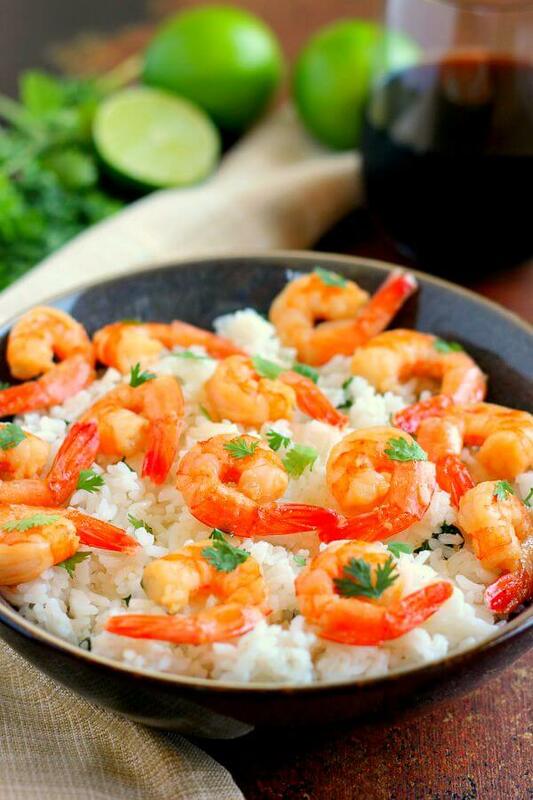 These shrimp look amazing, and the rice sounds so delicious! Shrimp, cilantro, garlic - those are some of my favourite things, so I definitely need to make this soon! Looks amazing! Pinned! Thanks, Stacey! Hope you love this dish if you try it! Thanks for the kind words, Cailee! One dish meals are my favorite, too! I'm not sure if I could eat cilantro plain, but I do love it in just about anything! Thanks for the kind words, Marcie! I also love anything with cilantro and this sounds fantastic! Those shrimp look amazing too! Thanks for sharing. Gayle this is such an easy yet totally comforting meal for fast paced nights! Looks so yum and that rice is my favorite! No!!! Don't say the end of summer!! Haha! Where I live we have about 2 months of summer weather left :( Those shrimp look so pretty and I love rice bowls! I sure don't want summer to end just yet, but unfortunately, I get the cold weather here in the midwest! :) Thanks for the rice bowl love, Izzy! This is definitely my kind of dish, this looks fantastic! 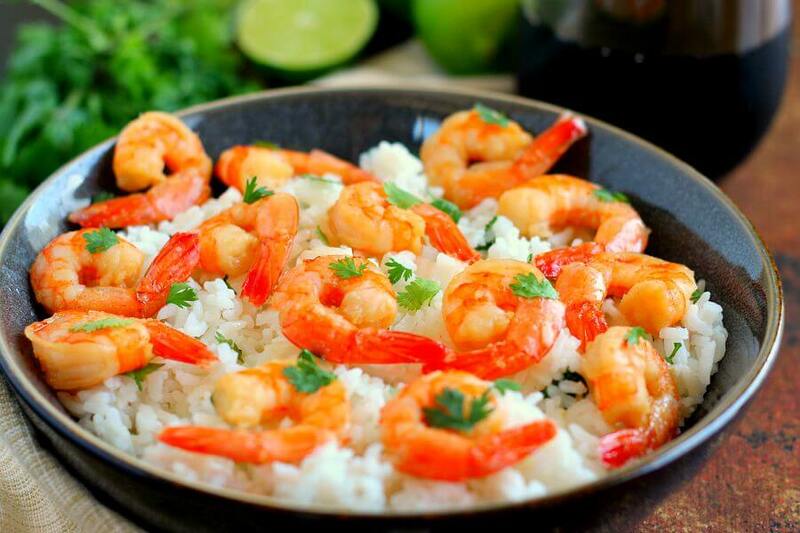 That shrimp looks so perfect too and I love the cilantro lime rice. I could definitely see myself devouring this! Thanks, Danielle! It makes a delicious weeknight meal! I'm really digging this 30 Minute Thursday idea! You can never have too many go-to fast and easy recipes for those busy weeknights! I'm definitely putting this honey garlic shrimp in the lineup! Yes! Easy meals are definitely the best, especially for busy weeknights. Hope you like this dish if you try it, Rachelle! This looks so perfect! I can't wait to try it. Pinned :). Thanks for the pin, Annie! Yay for 30 minute meals! I see lots more amazing things happening on subsequent Thursdays :) It's been SO hot here the last few days, I am totally looking forward to fall! YES! I love 30 minute Thursdays! And I'm looking forward to the fall too...bring on the apples and pumpkins! Funny that we both posted rice bowls on the same day. :) This meal looks perfect! I love your savory version and my family would devour the shrimp. YUM! Great minds think alike! :) Thanks for the kind words, Blair! Oh I know exactly how you feel. I'm sad to say goodbye to summer, even though I really do love fall. I guess I'm just not good with change. Ha! I am totally in love with this rice - I don't think I ever want to eat plain rice again! Haha I'm definitely not good with change, either! I just can't eat plain rice, either! I definitely wish summer would last just a little longer. Thanks for the kind words, Mira! I love meals like this - they are so quick and easy and make for the most perfect of dinner! Delicious Gayle. Easy meals are the best for busy week nights! Thanks for the kind words, Thalia! Yessss I love this dish Gayle! Is any rice better than cilantro lime? Yum!! I love shrimp and I love the garlic and honey combo! This is right up my alley :) I am also sad that summer is over, but at least fall is pretty and you can make pumpkin food!!! Hooray for pumpkin season! :) Thanks for the kind words, Katie! Yesss! These bowls look seriously SO amazing Gayle! I just want to dig into all that honey-garlic loaded shrimp goodness! Need to make these for the upcoming holiday weekend! Beautiful dish, shrimps are so simple to cook but half the time I can't get them right, sometimes I overcook them and sometimes I undercook them. 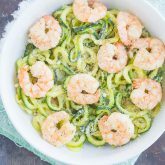 30 minute meals that involve shrimp are the best! :) Thanks, Kate! Honey garlic shrimp sounds fantastic! This could easily become my new favorite meal. Love that you paired it with lime and cilantro flavored rice. That honey garlic sauce sounds amazing! As does the rice! I don't eat shrimp (I know, I'm weird! lol) so I'll just have to make this with something else instead! haha Or make it for everyone else I know who all eat shrimp!! Have a fantastic long weekend!! Thanks for the kind words, Ashley! I know a lot of people that don't like shrimp, so no worries! :) This would be perfect with chicken, too! This meal would make me all the happy! Love all the flavours here and the presentation is lovely. This looks delicious! Shrimp is one of my favorite things to cook for quick & easy meals. The honey garlic sauce sounds so good! Great idea for 30 Min Thurs! Thanks for the kind words, Jess! Wow, these honey garlic shrimps I can eat every day. They look gorgeous. And most of all fast to make. Wonderful! Thanks for the kind words and for stopping by! These shrimps are definitely easy to make and so full of flavor! Wow! I just got done making this for dinner and it was so good! Even my husband, the shrimp snob, loved it. It was slightly sweet and had a bit of citrus tang...YUM. Next time, (there is going to be a lot of next times, I can already tell) I'm going to double the recipe for leftovers and add a bit of red pepper; I think the heat will be a nice variation. Thank you for the mom mom good and QUICK recipe. Keep'em comin! Hi Shelby! I'm so happy to hear that you loved this recipe! It's a favorite of mine (and my husband's) too. The addition of red pepper sounds fantastic! I will have to try that next time. Thanks for stopping by and for the kind words!